A speedier successor to the ThinkPad Tablet 2 (shown above) is being developed by Lenovo as the company tries to add more tablets to the mix in its personal-computing portfolio. The next ThinkPad will be based on Intel Atom chips code-named Bay Trail, said Stephen Miller, a Lenovo spokesman. He did not provide a release date. The tablet will not be based on the Intel Core processor code-named Haswell, which is used in Microsoft’s Surface Pro 2 and other business tablets, Miller confirmed. The Haswell processor is faster but provides less battery life. The ThinkPad Tablet product line is based on the Windows OS, and the new tablet will likely come with Windows 8.1. The current ThinkPad Tablet 2 is viewed as an enterprise tablet by Lenovo, and has a full-size USB port. There have been concerns raised in the past about the performance of ThinkPad Tablet 2, but the Bay Trail chip is expected to run applications two times faster, and graphics three times faster than its predecessor. The current tablets with Bay Trail chips start at $299 and have a 32-bit version of Windows 8. However, business tablets like the upcoming ThinkPad Tablet with Bay Trail and a 64-bit version of Windows 8.1 are expected to ship in the first quarter of 2014, according to Intel. There are some software compatibility issues on Microsoft’s 64-bit OS software with relation to Intel’s Bay Trail, which already supports 64-bit addressing. The companies are working out the issues now. The next ThinkPad tablet could also have more advanced manageability and security features compared to the current version. The tablets may include an Intel feature called VPro, which allows IT administrators to remotely manage the tablet. For example, IT administrators will be able to remotely shut down a tablet if lost or stolen. IT administrators may also manage specific features, and also take full control of the tablet remotely. 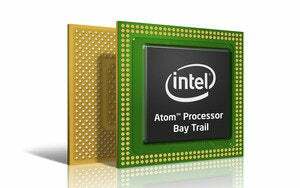 The Bay Trail chips will also be optimized for Intel’s McAfee security software.